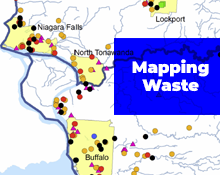 Mapping Waste, Setting the Stage to Clean-Up Niagara, produced a hazardous waste profile of three counties of WNY: Erie, Niagara and Cattaraugus. Using existing data sources, the project generated maps and charts that identify the legacy waste issues as well as on-going waste disposal and processes in the Niagara Region. This mapping project was proposed to be the first step in the development of a region-wide comprehensive argument for stopping the use of this region as a storage and dumping ground for waste from others. Working with the Waste & Pollution Prevention Working Group of the WNY Environmental Alliance sponsored by the Community Foundation for Greater Buffalo, UDP outlined the federal and state regulatory contexts that monitor, manage, oversee and permit waste in the Niagara region. Using the available databases, UDP produced an Atlas — maps and charts of the various classes of waste. This information was organized first by type of waste, and then according to the agency responsible for its regulation. The report also offers a series of case studies of waste identification and clean-up in the region, giving insight into the relationship among the agencies, the contamination, and community efforts. The Mapping Waste project emerged as one of the agenda items identified by the Alliance during the first three Congresses held in 2008-9. In general, there was a concern that WNY has more than its share of toxic sites and a concern that much of our legacy waste was left before there was effective environmental legislation for managing the material. This entry was posted on June 20, 2018 .